I love a good refashion and was inspired to do this one when I read about the Australian Sewing Guild's 'Castaway to Couture' competition. 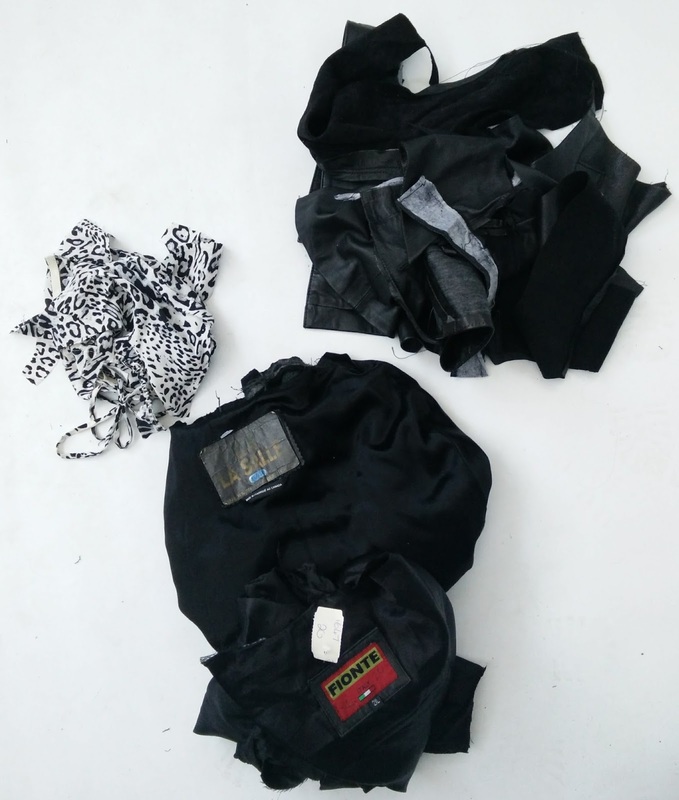 The idea is to refashion up to three secondhand garments into one new wearable garment with minimal waste. The competition closes on 31st May and is open to Australian residents, so get in quick! I wanted to make a leather jacket and the StyleArc Ziggi was the obvious choice. I have made it before in two tone brown leather and I love the fit and style. This time I wanted a classic, black, leather jacket. I started off with a leather jacket that my grandmother bought for me many years ago and which I no longer wear. It was made with lovely soft, thick leather, but there wasn't enough leather in it to make the Ziggi, which did surprise me a bit. I cruised the op shops and found a second leather jacket for $20 and a silk, leopard print maxi dress for the lining for $8. Interestingly, op shop leather jackets vary hugely in price, even between stores in the same chain. Also, I really struggled to find a silk dress. In the end I just went down the dress rail looking at every label until I finally found one that said it was silk. Next came the planning. 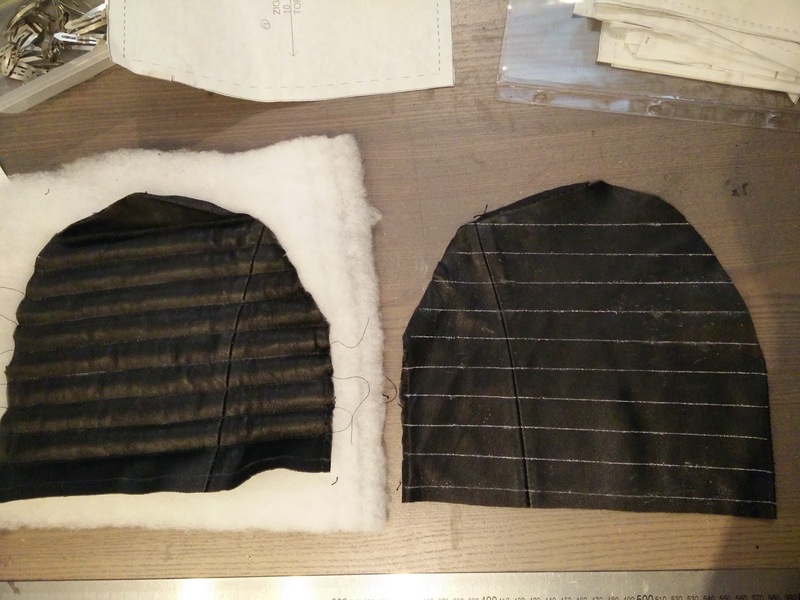 The Ziggi jacket has 23 pattern pieces, 14 for the main fabric and 9 for the lining. This part took absolutely ages. I wanted to try to avoid holes made by the original stitching and buttons and to minimise the wastage. I planned to cut all the main body pieces from the thicker leather jacket and the sleeves, large front facings and other bits from the thinner one. 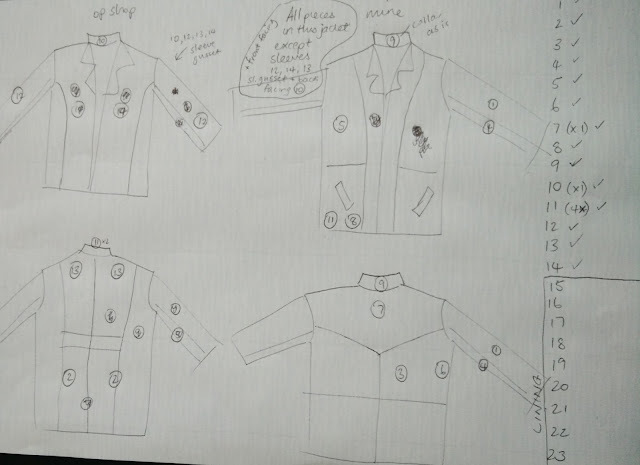 I also wanted any original seamlines to be symmetrical in the new jacket. I had to draw a rough diagram to remember the layout. As luck would have it, the collar from one jacket was exactly the right size and could be re-used intact. 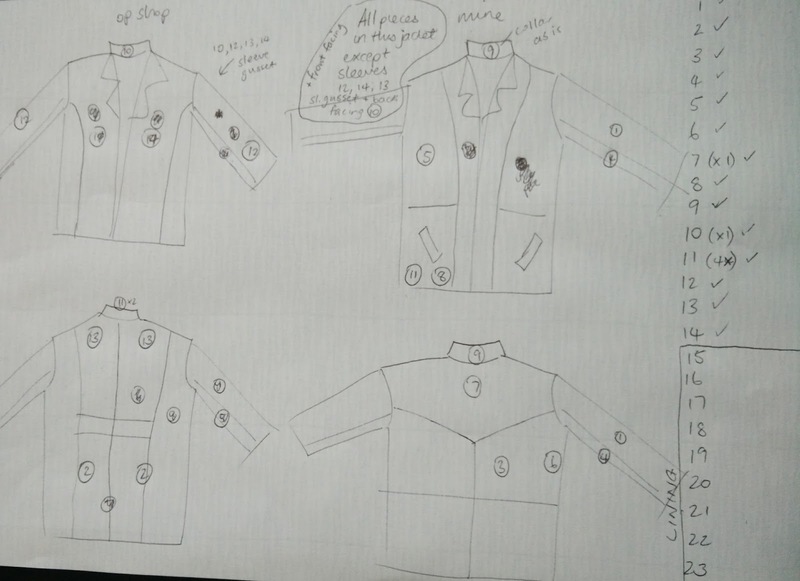 Next, I unpicked the original jackets to give me large enough pieces from which to cut my new pattern. I got impatient a couple of times, but that resulted in tearing the leather, so I was forced to go slowly! I was then ready to cut everything out. I ended up having to make some changes to my first cutting plan, partly because I forgot to mirror the side front piece and cut two the same and partly because I did a last minute broad back adjustment, but I eventually got there. 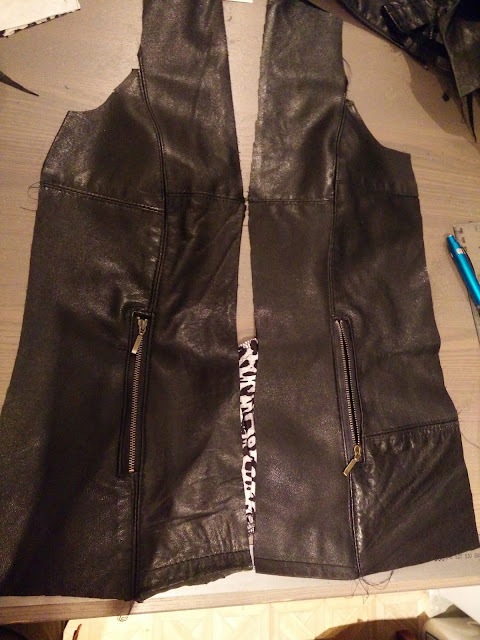 The dress was not quite enough for all the lining pieces, so I cut the midsection of the sleeves from some of the original polyester jacket lining. This doesn't show in the finished jacket. I topstitched any remaining seams from the original jackets and all the new seams so they would match and look intentional. Those blasted side fronts didn't have their original seams matching after my cutting error, but all the other pieces did. The lower edge showed some original stitching holes, but these were hidden once the hem was folded under. I decided to quilt the upper sleeves like some jackets I'd seen online. I was very happy to have found the wadding at Remida recycling centre, so that was also saved from landfill. The only thing I bought new were the zips. They were from Homecraft Textiles. I inserted sleeve gussets that weren't in the Ziggi pattern. For the sleeve gussets, and the pocket zips, I used tutorials by Shams of 'Communing with Fabric'. Leopard print is not really my style, but I quite like it as jacket lining. The silk feels lovely to wear. You might just be able to see the original hanging loop (below) that I saved and restitched into the new collar seam. You can also see the original seamlines in the leather front facings. These are mostly hidden when worn. I like how the original seamlines add extra detailing to the new jacket. And here is what was left over from the project. 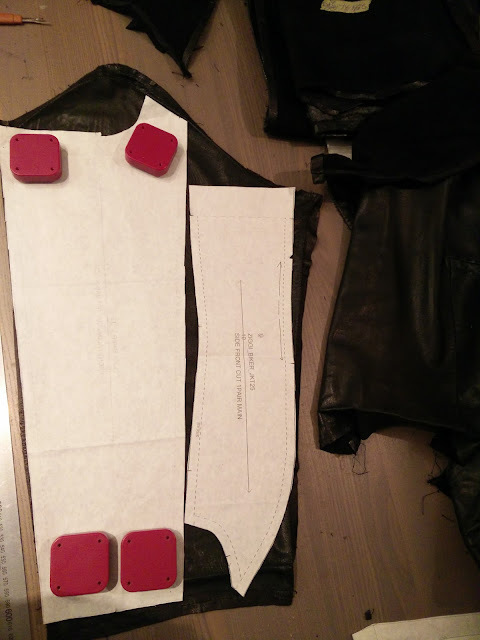 Some leather scraps that I will save to make something else, most of the original linings and tiny scraps of the dress. This has been one of the most ambitious projects I've ever done and the whole process was incredibly time consuming. I really had to think carefully and go slowly the whole time to avoid silly mistakes. It was incredibly enjoyable and satisfying though and I have ended up with a jacket that I absolutely love. The fit is excellent and the leather and silk are soft and comfortable to wear. I will be wearing this at every opportunity. I am also very happy to have breathed new life into my treasured, but long unworn, jacket from my dear old Nan. This is the collage I put together for my entry. Voting for the competition begins next week on the 1st of June. If you are an Australian resident with some spare time over the next few days, get refashioning and enter yourselves. There are some great prizes on offer. Oh my goodness...this is absolutely incredible. Your vision and refashioning skills are amazing. Gorgeous jacket! All the best in the competition. All that and the worst word you used was "blasted"! I really don't think I could sustain a project of that complexity. Well done you! LOL, I may have used a couple of other words as I was actually sewing! FANTASTIC! 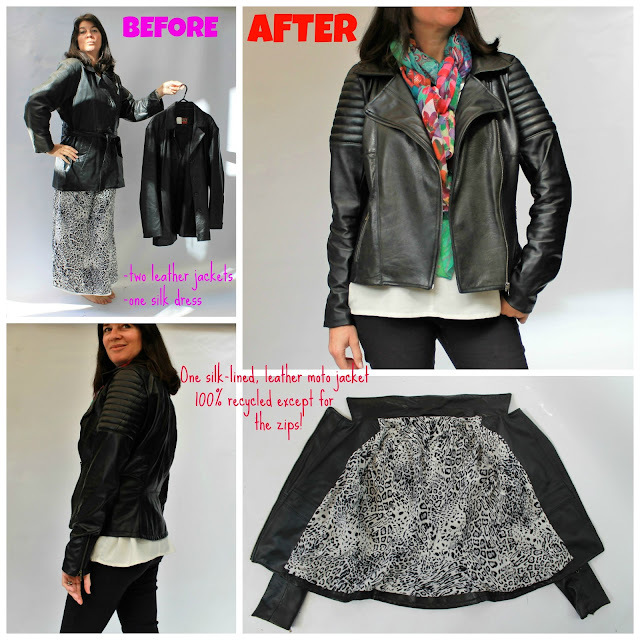 I love the idea of using old leather jackets and your result is so cool! what a great jacket you can wear for years to come. In fact I've been holding on to a navy blue suede jacket I bought in Italy ages ago and now I'm inspired to turn it into something else. Hope you win! I held on to my old jacket for far too long. It feels so good to have made it wearable again. Go for it! WOW--I'm very impressed! I would never have had the patience to do this. Wonderful work. I was blessed with endless patience, well for sewing at least! It is fun to tackle a really big project once in a while. Thank you! So ambitious and inspiring! Well done! That is one awesome jacket. You're totally going to win and I want to see the prizes! Good luck! LOL, I am very flattered that you have such confidence! That looks like a winning entry to me. I will have to come back and read your post in detail when I am not rushing to get everyone out of the house! You are amazing. This jacket is a real credit to your creative skills and determination. 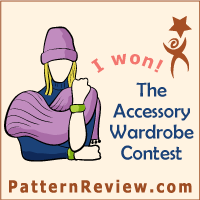 Well done and good luck in the contest. You're so lovely. Thank you! Think looks amazing. What a mind puzzle! You did a great job. Good luck in the contest! Wow. You better win that prize! You clever chook! Not just a refashion ...a style statement. So cleverly done. What an absolutely wonderful jacket! Whattttt??? Amazing work!! In love with the new version! Wow, I am flabbergasted by this, it's brilliant on all levels!! Wow it is really great content. Thank you for sharing this clear and valuable content. Wow, awesome!!! I like this blog. The issue of sleeve size can be dealt with in various distinctive routes from snaps or catches to flexible in the wrist band of the coat. Just awesome . I inspired . A lot of thanks for shred these fashionable dresses . i love your dress and style so beautiful.